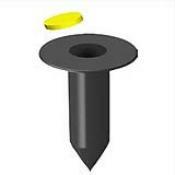 Athletic field ground sockets, Make field lining easy. Individual 8" ground socket with plug. Used in all of MarkSmart™ field lining kits, designed to mark critical locations on your athletic fields.